Snow mountains are not a part of traditional Chinese aesthetics for some historic reason, esp. remote mountain region are the territory of minority ethnics. The infamous 五岳 (Five sacred mountains of China) only barely breach above 2000 meters. When CNG started the Scenic Splendor of China selection, one of its goals is to introduce non-traditional aesthetics to Chinese people. They focused on those remote regions which have been ignored by traditional view. Of course, snow mountain peaks are the first to be introduced. Among these ten most beautiful mountains in China, seven of them are snow mountains, only three are traditional famous mountains. As CNG said, wish Chinese people start to enjoy the beauty of snow peaks. You can view all these first half five mountains in Google Earth here. Namcha Barwa is the 15th highest peak in the world, and the highest peak below 8,000m. 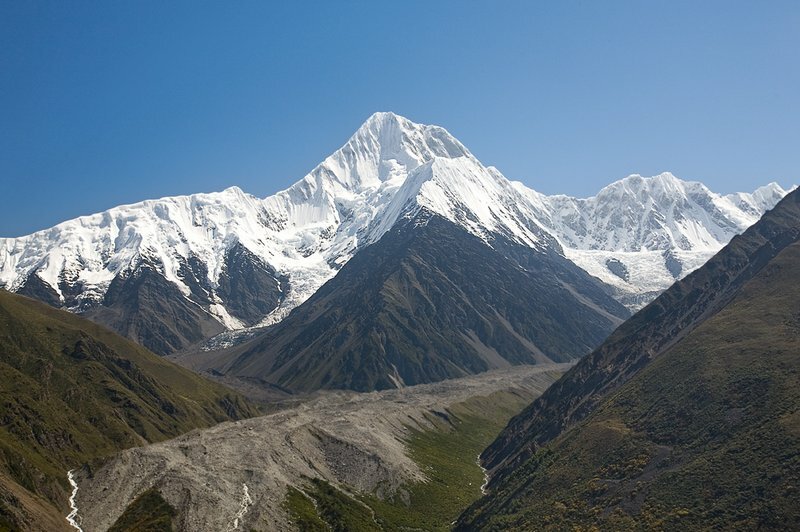 Located in the Great Yarlung Tsangpo Canyon region, Namcha Barwa and its adjacent mountains are geologically active and unstable, which made it one of the hardest peaks to climb in the world (not until 1992). Its south slope has a very unique vertical plant distribution pattern. From the summit of Namcha Barwa down to Pasighat (where Yarlung Tsangpo river flows out of China), from permanent snow peaks to tropical banana trees, this climatic zone of sharp contrast spreads within only 200 km of its south slope. 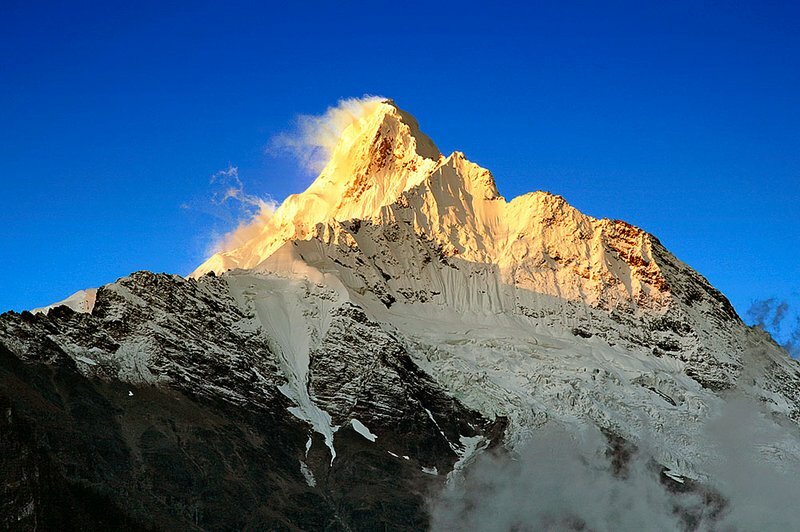 “The King of Sichuan Mountains”, Gongga Shan is one of the most dangerous mountains in the world. Only 24 people had ever made onto the summit; but 37 died on the way up to or return from the summit. Besides its alpine scenic views and fame among climbers, Gongga Shan has a well-developed Glacier system – the Hai Luo Gou glacier, one of the Top 6 Glaciers in China I introduced in a previous post. Also known as Mt. 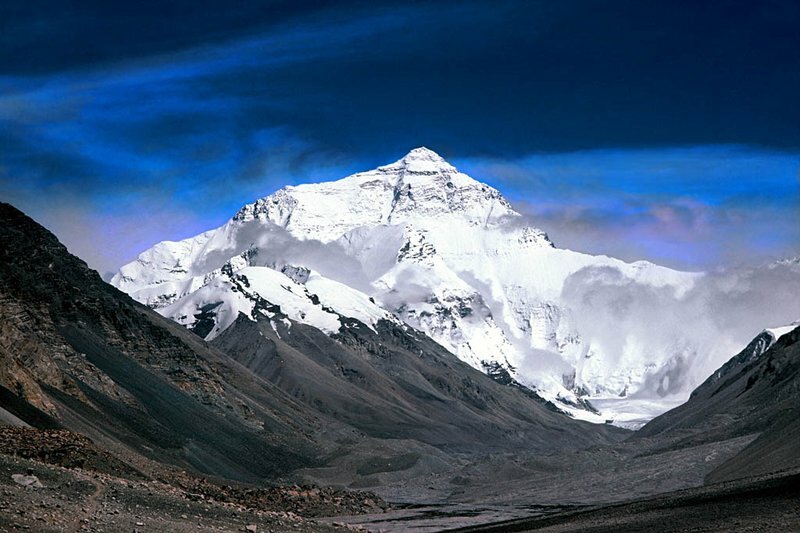 Everest to westerners, Qomolangma (Tibetan: Mother of Earth) is the highest peak “the third pole” of our planet Earth. Qomolangma used to be a seabed; it rises when Indian Plate crush into Euroasian Plate millions of years ago. And it’s still rising now, with a speed of 2-3 meters per thousand years. There are more than forty 7000+ peaks within 20km range of Qomolangma. These high mountains form beautiful glaciers, e.g. Rongbuk Glacier is one of the Top 6 Glaciers in China I introduced in a previous post. Located in the “Three Parallel Reivers of Yunnan Protected Area” region, Meili Mountains (13 snow peaks) is the boundary between Yunnan and Tibet. 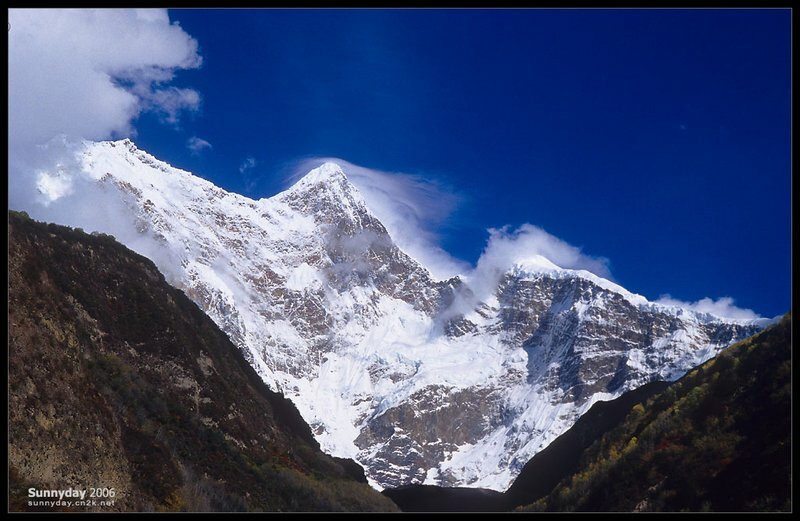 Its main peak “Kawakarpo” is the highest peak of Yunnan province. Kawakarpo is the top one among Eight Tibetan Sacred Mountains, which is of exceptional important religious meaning to Tibetans. Kawakarpo is still a virgin peak to human climbers. After decades of attempts and failures plus a long death toll, and mostly importantly, to respect the religious value of TIbetan people, the government banned mountain climbing to Meili Mountains forever. A Chinese proverb says: you have no wish to visit any other mountains after viewing the Five Sacred Mountains of China; You do not even wish to visit them after you come back from a trip to Huangshan Mountain. 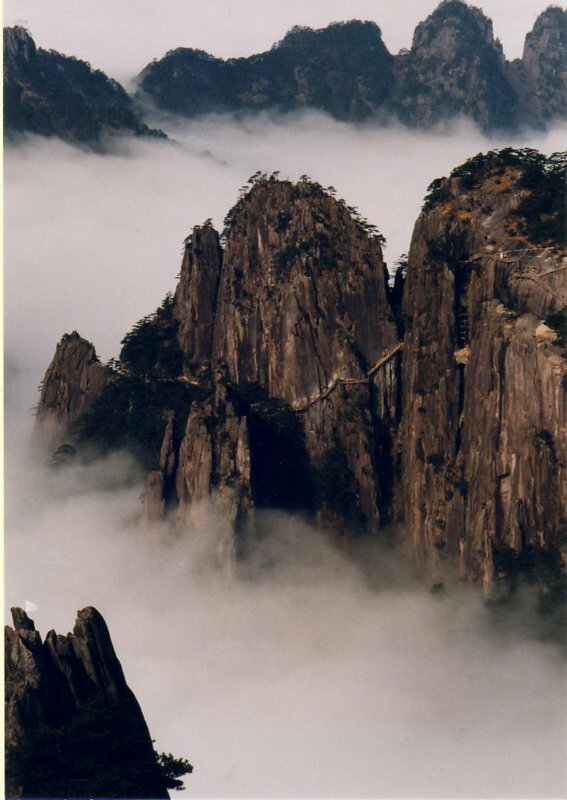 Huangshan is famous for its “Four Wonders”: strange pines, absurd stones, sea of clouds and hot springs. 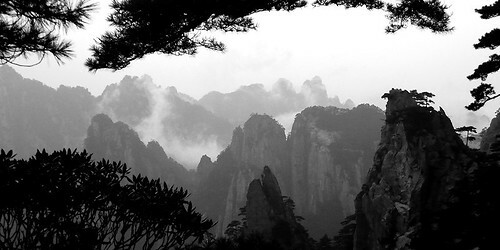 “Winter Snow” might qualify as an extra fifth wonder of Huangshan.